The stalling with a neck rail at the feeding table offers the animals high freedom of movement during eating. For this feeding place arrangement, a feed guard can additionally be placed along the manger wall. Wood is often used for it, but it wears out very quickly. Another option is to use a brisket board made of rubber as feed guard. "This raises the manger wall. So, I can provide more feed and it is more difficult for the cows to push it into the walkways while eating. Additionally, the transponders on the collars do not bang against the concrete anymore, while the animals are eating. This makes the cattle house a quieter place and the transponders don't wear out so quickly. The animals feel comfortable while eating and we have fewer feed losses." "The ergoBOARD is very animal-friendly because of its ergonomic shape. The cows may not be injured so easily because of the flexible rubber. Due to the wavy form of the ergoBOARD, the cows are held back while eating and shove less feed into the walkway. 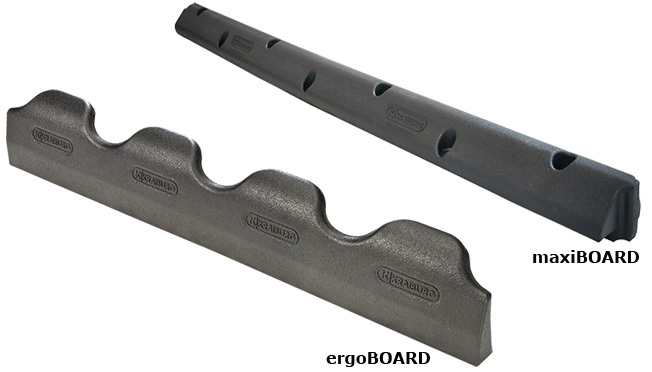 The ergoBOARD makes the manger wall higher, which reduces the amount of concrete required."